Auguste employs unconventional materials and techniques such as aluminium, photo manipulation and automotive varnish to create this mixed media collage. Set in the streets of New York City, this surreal composition unites real and fictional icons from vastly different character universes. It breaks such boundaries to form an amalgamated vision of contemporary pop culture, in the unique style of glamour pop. 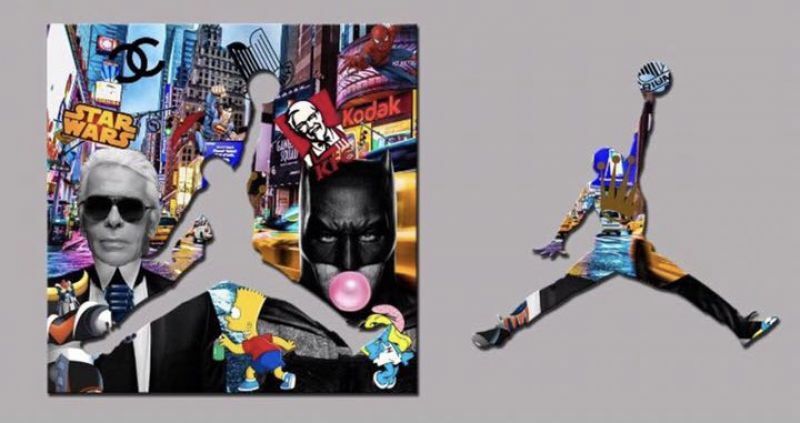 The dense image contains multiple layers superimposed on top of one another, blurring the lines between celebrities, cartoons, superheroes and icons. I'm interested in this Karl vs Batman by Auguste. Please advise availability and price. Thank you. Born in 1977, French artist Auguste hails from the famed Bordeaux region of France. Though he studied disciplines other than fine arts, Auguste always felt compelled and drawn to the art world. Ultimately he followed his passion for the visual arts, finding his unique artistic vision and voice and is now known for his colorful contemporary Pop Art-inspired and nostalgia-evoking works.Auguste terms his oeuvre “Generations” as his works revolve around a central theme of pop culture icons from the past. Conjuring memories of previous eras, his pieces depict celebrities, super heroes, and other iconic figures in conjunction with American and French marks to provide the viewer with a reminiscent glimpse of past epochs.